eShe is an independent monthly magazine for women published out of New Delhi. Aekta Kapoor is a lifestyle journalist, and the founder editor of eShe magazine. e-She - An independent magazine empowering women around the world. Little did I know that this yearning would bring about a turning point in my life. A close friend suggested that I start yoga classes, and that was how this beautiful practice became a part of who I am today. Yoga is a life-changing philosophy. 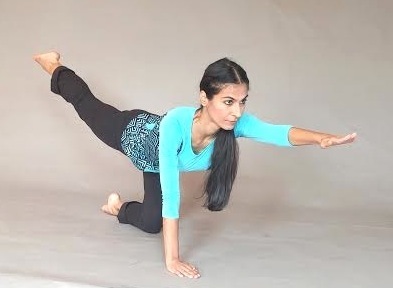 Soon after starting the practice, I felt much healthier and more flexible as my body opened up with the asanas. I automatically became more conscious of my diet. The breathing techniques made me feel calmer because my mind was present in the moment, and this released all the tension in my body. After practicing two and a half years of power yoga from an inspiring woman, I began my practice of the traditional school of Hatha yoga. THIS IS WHERE MY MENTAL TRANSFORMATION BEGAN TO TAKE PLACE AT A DEEPER LEVEL. There was increased focus on each posture, along with breathing techniques and mantra-chanting. I felt as if I was in a meditative state. Yoga for me became a practice not just on the mat, but off the mat too. The smaller things in life started to bring me joy, and I felt a deep sense of gratitude towards my work, family, friends, employees, the beauty around me, my yoga practice, my own body, and the list goes on. The curiosity to deepen my understanding of this philosophy and also to share it with others led me to undergo a professional teacher’s training course from learned gurus at an international school of yoga. Those five weeks were completely transformational for me. Yoga means union of the individual soul with the universal soul. When one understands that there is a force greater than you and I, you start to believe in the impossible and make it happen. My perspective towards life and every situation I am faced with, be it at work or outside, has changed. I am aware of my thoughts, and because I make it a point to always focus on the positive, I feel a sense of gratitude, peace and happiness which is absolute. With the practice, during meditation, asana, and Pranayama, my body and mind have become stronger and I can in turn focus better – even on my design work. A sense of discipline has also come into my life, which gives me more energy for long days in the studio or in my workshops. Eradicating the ego is extremely challenging, as it exists at some level within all of us. But through yoga, I am learning to let go of it. You begin to understand yourself and accept yourself. I am excited to share this philosophy with people and continue to deepen my learning, which is lifelong! 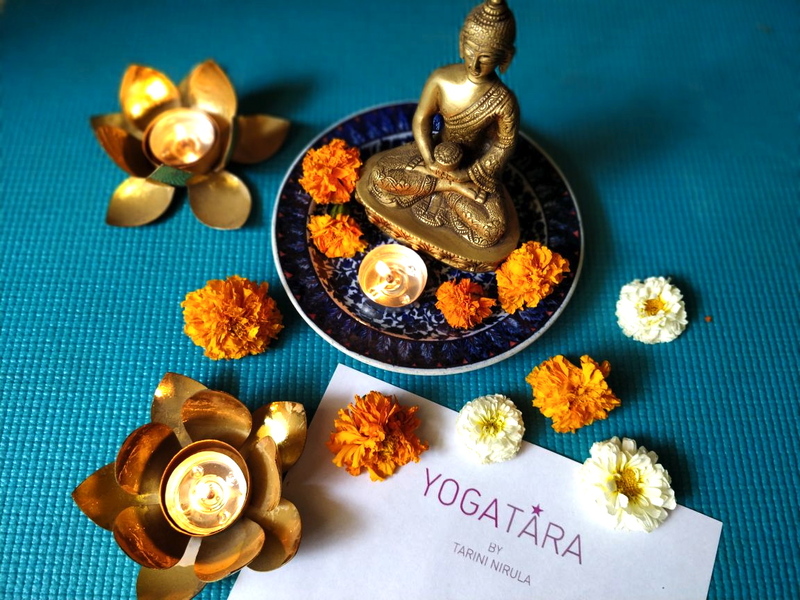 The benefits of yoga are innumerable; you just have to practice it with an open heart and feel the love, peace, health and happiness start flowing in, just as I did. This blog is the brain child of Simran Gill, an academician by profession. 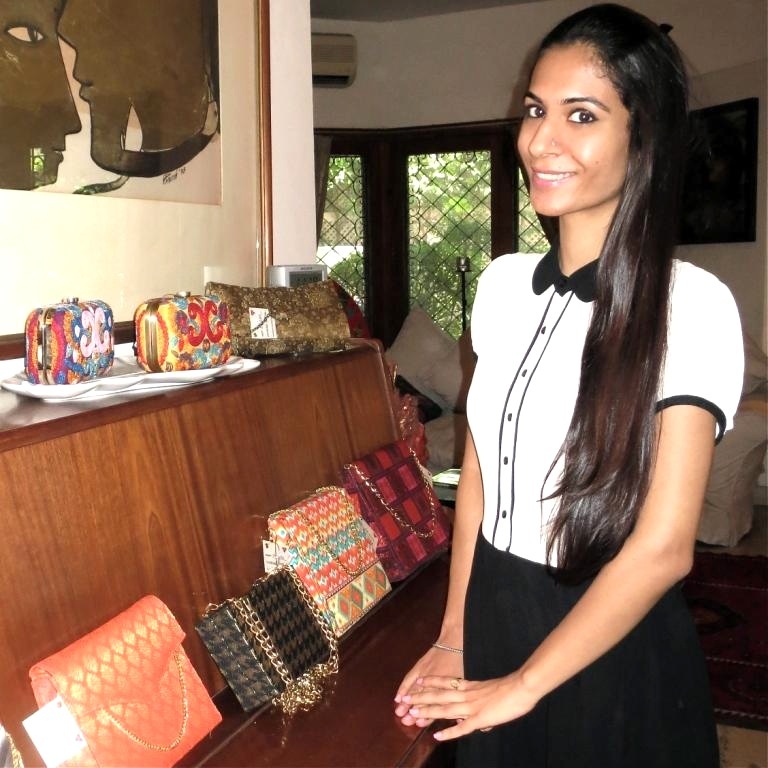 It is her sheer love towards fashion that inspired Simran to start the 'Vogue Amigo' blog. The intention is to bring to the audience an eclectic mix of individual fashion sensibilities with comfort being of paramount importance, and yet being able to push the boundaries. “Fit&Fab” is the new age mantra! All of us aspire to live a healthy and fit lifestyle. With the kind of hectic schedules that we follow, its imperative to stay health conscious. When I say “health conscious”, it not only means being physically fit but having a holistic approach towards life! Being a Punjabi, I’m naturally drawn towards my Aloo-Paranthas (Flat bread stuffed with mashed potatoes and herbs) and Rajma Chawal (Rice and kidney bean curry). I don’t really compromise with food and being blessed with a fairly good metabolism is an added bonus! But that doesn’t take away from the fact that I’ve always been into fitness, be it in the form of dancing, running or working out in the gym. However, after I resumed teaching, my schedule went haywire with having to mange both my school work as well as the blog. That left me with hardly any time to focus on fitness which eventually started affecting my health and mood. Hence, I’ve been making some real efforts to follow a fit regime. I try going to the gym at least 4 days in a week and also dedicate some time to Yoga which helps me stay calm amidst all the mental pressure. It was precisely during this time while I was conversing with Tarini Nirula, that she happened to inform me about her new line of “Yoga Tote Bags”. 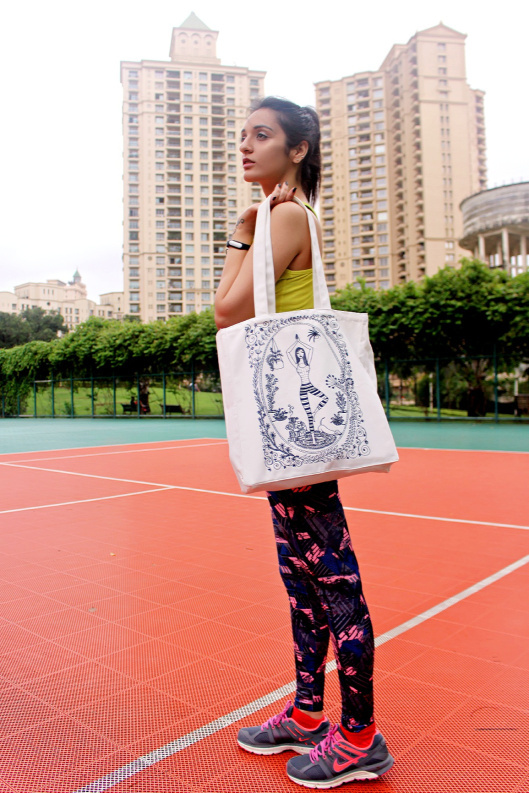 Being an ardent yoga practitioner herself, she believes this tote is an ode to all the yoginis and fashion enthusiasts! This collection has beautiful handmade illustrations depicting peace, wellness and joy! 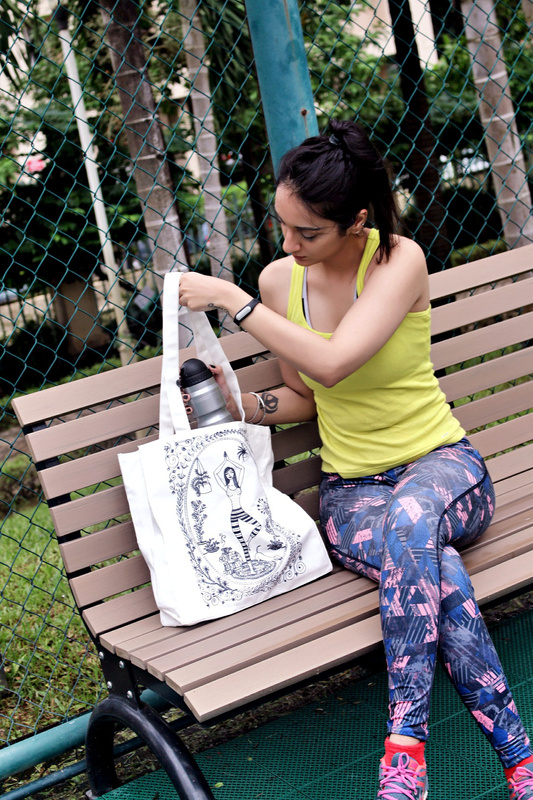 Considering how important it is to have the right workout gear and essentials, the Yoga Tote Bag is the perfect companion, designed to hold all your workout essentials. So here you have a bag which is not only stylish but also utilitarian. High-five to that!! You can carry this bag for Yoga, Pilates, gym or even when you go out for brunch, shopping, or head to the beach, hence proving its versatility! I’ve styled this Yoga tote bag with my current favorite printed New look tights, neon tank top and Nike running shoes. Keeping in mind the essence of the story, I kept my hair in a high pony and my face with barely any makeup. Do let me know your views on this story. Your feedback is always valued! You can check out Tarini Nirula’s collection on the link given below!